Ceramic Pro and its manufacturer Nanoshine Ltd are changing the dynamics of the coating industry. The company has for years worked on industrial multifunctional protective coatings for all surfaces and strives to continuously improve their products. 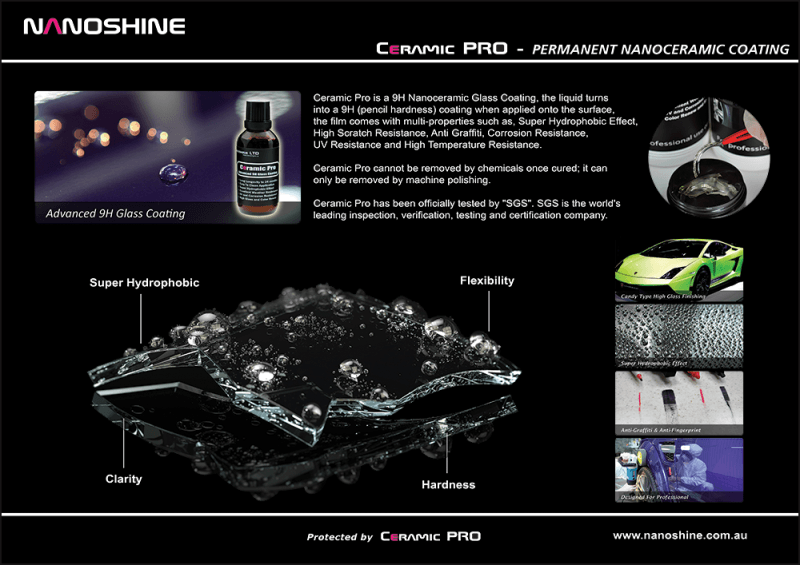 In 2010 Nanoshine Ltd introduced Ceramic Pro – a series of products for the automotive, air and marine markets suited for surfaces such as paint, glass, alloy, fabric, leather, plastic and rubber. What makes Ceramic Pro different is the cutting edge technology based on ceramic molecular compounds (nanoceramics). The formula is world patented and it has taken ten years of research and testing to bring the product to where it is today. All formulas include SiO2. When cured, this technology will transform itself on the surface to a permanent, rigid, flexible glass shield. A transparent 3D matrix structure protects the surface from minor scratches, graffiti, dirt, aging, premature oxidation. It offers excellent thermal (2500 F), UV, oxidation, corrosion and chemical resistance. A surface that has been sealed with Ceramic Pro 9H stays clean for a longer period of time due to its smoothness and hydrophobic qualities. Ceramic Pro is permanent coating and can only be removed if maintained correctly using machine polish hence we often sell it with a lifetime warranty. The unique formulation of Ceramic pro has enabled it to be multi-layered which means the thickness of the coating can be increased with additional layers allowing a thicker/harder film that will increase protection. The world‘s leading inspection, verification and certification entity. Ceramic Pro achieved the highest possible result in each test; no other automobile paint protection product to date has been officially tested. All products within the Ceramic Pro range have been tested and certified as non-toxic. Ceramic Pro has representatives in almost all countries in the world and is currently experiencing exponential growth. Ceramic Pro product range includes both water based and solvent based products with a 30% – 70% Silica (SIO2) content. The products have gone a number of standardized ASTM and ISO tests backing up the claims mentioned above. Ceramic Pro was originally designed for the oil industry and space industry but expanded quickly into other industries such as automotive marine and aviation.